Investors are feeling the Monday blues. 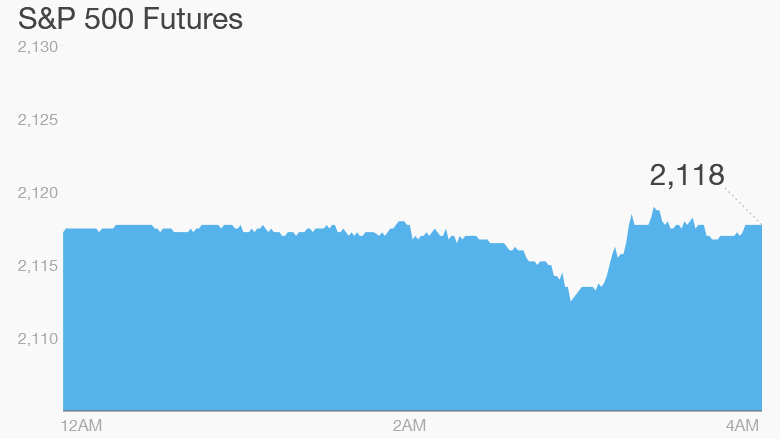 U.S. stock futures were pointing to a soft start to the trading week, taking a breather after a recent record-breaking run. 1. Earnings and economics: It's a big week for retail earnings and Urban Outfitters (URBN) will kick things off with its quarterly report after the close. Earnings reports are on tap later this week from Wal-Mart (WMT), Target (TGT) and Best Buy (BBY). On the economic front, the National Association of Home Builders release its monthly housing market index at 10 a.m. ET. 2. Oil climbs: Crude prices gained about 1% to push above $60 a barrel as investors absorbed news of fresh fighting in the Middle East. The key Iraqi city of Ramadi fell to ISIS on Sunday, while airstrikes resumed in Yemen as a ceasefire ended. Oil prices have stabilized in recent months after plunging around 50% in the last half of 2014. Related: Have an investing question? Ask CNNMoney! 3. International markets: Major European markets are edging higher in early trading. Germany's DAX is the strongest performer, up 0.9%. Asian markets had a mixed day. 4. Friday recap: The Dow Jones industrial average gained 20 points, while the S&P 500 inched up 0.1% to a fresh record close. The tech-heavy Nasdaq lost 0.1%. U.S. stocks have been powering ahead despite mounting evidence that the American economy isn't all it's cracked up to be.